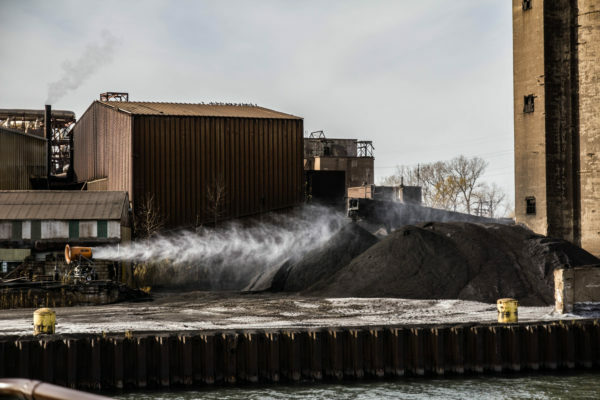 At the Headwaters, Petcoke piles along the Calumet, photograph by Koy Suntichotinun, 2015. Photo courtesy of artists. Last winter, I had the chance to interview Lindsey French, Gulsah Mursaloglu, Sarah Ross, and A. Laurie Palmer, about a collaborative exhibition they participated in with artists and students at the Marshall J. Gardner Center for the Arts in Gary, Indiana. 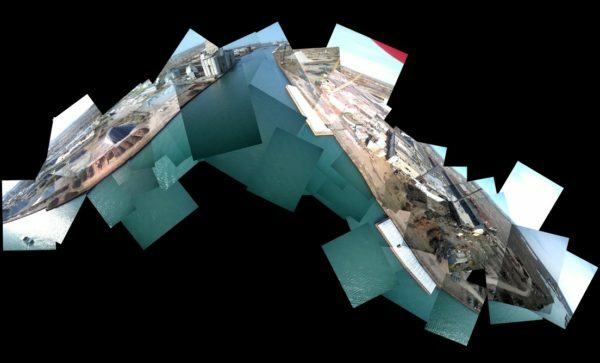 Featuring maps, photographs, videos, and books, At The Headwaters (November 6-22, 2015) explored the Calumet River—a series of highly industrialized waterways connecting Lake Michigan, Chicago, and Indiana. With its French Colonial name and a directional flow that humankind has changed to serve its trading needs over the years, it muddles any delineation between culture and nature. The Calumet is Anthropocenic and At The Headwaters traces its relationship to petcoke, steel, international trade, and the pollution it produced. Caroline Picard: What made you all interested in the Calumet River? How did you decide to work with students? Lindsey French: We were interested particularly in it as the site of petcoke deposits, a petroleum by product that was being stored open air along the Calumet River. When we decided to choose this site last fall, petcoke was in the news, and as we learned more, its reach spread not just airborne to the local community, but its effect and implication extended to sites like the Alberta Tar Sands and ourselves and the petroleum industry, of course. We also chose this site for balloon mapping because balloon mapping affords the potential to capture a map of a place in a particular moment of time – distinguishing it from a more standard, or maybe public, view from google earth. So while pet coke might have drawn us to the site, we were also interested in the Calumet’s particular as complicated role as an industrial river. Gulsah Mursaloglu: Also we were interested in the Calumet river as a site that is so proximate to us, but one that we know very little about. In a way it was an attempt to fill one of the holes in our knowledge about the environment that surrounds us.As we started researching we became more interested in the pet coke deposits and how it was affecting the local community. Since Calumet is a particularly dynamic site as Lindsey said it became important to capture an image of the site at that specific moment in time. A. Laurie Palmer: The Calumet also offers a condensed and multi-sensory experience of industrial history more generally, as others have said, at a particular point in time when it is disappearing, or has disappeared, leaving the mounds of jumbled parts, wastes, and abandoned steel yards now used for storage for another kind of materiality that is not so much human-made, as in manufactured, but machine-made, as in captured flue gas, pulverized coke. 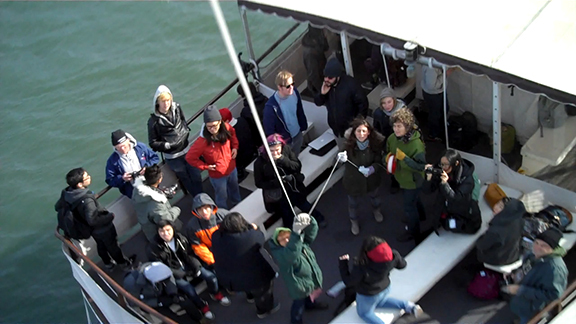 While none of us wanted to do ruin tourism, there is something to be said about the stimulating effects of a cold boat-ride on a clear november day with close to 70 curious people; there is something to be said about amping up sensory engagement even as the experience was initiated as a critical practice of DIY sensing, and of putting ones body there, in the thick of it, holding onto the other end of the balloon. CP: Can you describe the project and how it came about? Why make an exhibition? How did the works on display come into existence for this project? GM: The project started as a balloon mapping collaboration between three classes at SAIC. Our initial aim was to have a different perspective of the site through the balloon mapping process; all of the classes were interested in how we understand geographies and how our understanding of these geographies are so much determined by our limited visions. After our research and balloon mapping experience on the Calumet river and the things that we learned through conversations with the community members we wanted to present these findings in the format of an exhibition. We wanted this exhibition to be presented in Miller Beach which is one of the sites that are affected by the petcoke deposits and we wanted to share our findings and present a different vision on the location to the local community. The works in the exhibition vary from documentation of our boat trip to knitted maps, to the balloon which was the departure point to everything, to works that are made after the boat trip as a reflection to our trip and findings. At the Headwaters, Class portrait from the balloon, 2016. Photo courtesy of artists. CP: Would you consider the river a collaborator? How? And do you consider the river in the same way now that you did when you began? LF: The river is perhaps the element in this project with the strongest, or maybe most consistent, influence. But strong and consistent in a more liquid sense, in the sense that it was a structural force that moved between the industrial sites on each bank and moved us between those sites. But also in the sense that it was this strong, central feature that shaped our understanding of the project, and also allowed us to think about its influence as it leaked out of this site and into neighborhoods, into the city, into the tar sands in Alberta, into us as inextricable from the materials it moved and the social and political spaces it shaped. As we were discussing how to organize the show the river as a structural feature came about really early, a form around which everything else was organized. Speaking for myself here, I think if we didn’t approach it as collaborators we might not have been as open to understanding our own liquid qualities. Sarah Ross: I would just add that, for me, the river is a collaborator in the same way that a freeway is. The river is a highway for goods, raw materials, and only sometimes used for recreation. In this way, it is an ecosystem in the most broad sense. It is part of my ecosystem because it facilitates all manner of materials that I use. Other work I’ve done looks at river systems that move materials so I understood the way ‘natural’ features are part of industrial systems. But moving down the Calumet it was pretty amazing. The river was engineered and modeled for industry. The turning basins, concrete embankments, and lack of trees or marsh was pretty astonishing. It is all industrial. CP: What privilege does/did the boat offer you all? And what about the balloon? LF: The boat afforded this particular opportunity to travel while mapping. In earlier projects, mapping was done from a relatively static location. On the boat, we could move along the length of the river, generating an aerial view for a much longer length of the Calumet. Maybe even more significantly, it located us in the physical position of the river, and of the materials that travel down it. We could momentarily position ourselves as materials traveling the industrial river. The balloon gave us an extension of sight, an augmentation of vision, like other lens-based viewing apparati. We talked a lot about the balloon vision—the lo-fi but high-altitude perspective of the balloon. ALP: and just to add to that, again, our bodies there too, being watched by the balloon too – not absent staring at a screen in a distant relation to the place being mapped—but feeling, smelling, sensing the place at the same time. CP: How do your roles as teachers/students function within the process of organizing and producing this exhibition? SR: We met with students over the summer, almost on a monthly basis to figure out how the show could work. Since we had collectively gathered data—images, video, sound, etc.,—we used that as the basis for the work. We thought of the work as a collaborative endeavor, which might be a different starting point for some students who are often encouraged to make their own work, for their own portfolio, etc. But since it was a huge group effort to do the balloon mapping, it only made sense to approach the work in this way. As teachers, we contributed the same way students did, sometimes more and sometimes less. We acted as initiators of the process, we set meeting dates, etc. but the production was quite an open, dialogic process. ALP: To do the balloon mapping expedition, we had to be collaborative to start with, and since so much of the material generated from that initial trip was documentary, and it was shared experience that was being documented if by lots of different eyes, it only made sense to think together about the show. And then we invited other artists to join in at Miller Beach, some whom we knew had already been involved with thinking about the rivers in Chicago and related environmental justice questions. At the Headwaters, 1. 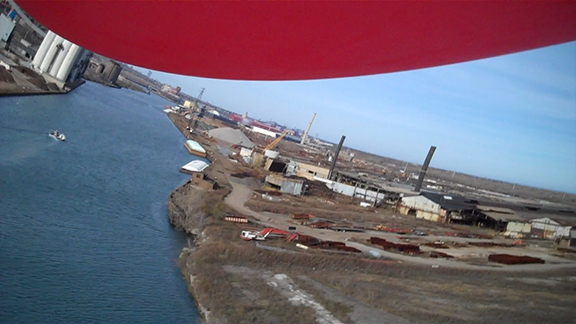 Aerial view along the calumet, 2016. Photo courtesy of artists. CP: It sounds like you all are interested in a kind of mapping for this show. Is that true and if so, can you talk about how/why that impulse plays out in this project? GM: Since everything started with the idea of balloon mapping—having a different perspective on a site—we wanted the idea of mapping to be the framework for the show. We knitted digital maps from the images we have gathered through the balloon. We are interested in mapping as a way of representing a space/location; because it is a particular way that grants the maker agency and creativity. A map of the Calumet river that will be built in 3-d will act as a spine through the exhibition, both physically and conceptually. This format allows us as creative makers to both represent our findings and observations and reflect on it. ALP: That map or spine that structures the show was beautifully elaborated and manifested by Lindsey French’s current Experimental Geographies class, a group of students who weren’t even on the original boat trip. This was another kind of collaboration, their taking that idea and running with it. The idea of the map came in part because the exhibition space at Miller beach is so huge, and it is rare to have the opportunity to expand into such a large space. The map acts as a kind of locator for visitors, in an otherwise open space, providing potential paths, directions, way-finding, and complicating the space without putting up vertical barriers. At the Headwaters featured the work of Marissa Lee Benedict, Nathan Braunfield, Samantha Chao, duskin drum, Corey Hagelberg, Brian Holmes, Sarah Lewison, Frances Emma Lightbound, Gulsah Mursaloglu, Thomas Newlands, Allyson Packer, Dan Peterman, Alix Shaw, Koy Suntichotinun, Jan Tichy, Fereshteh Toosi, Maurice Walker, Patrick Zapien, and students in KnowledgeLab, EcoSensing and the Soundscape, and Experimental Geographies classes at SAIC; with organizers Lindsey French, A. Laurie Palmer, and Sarah Ross.